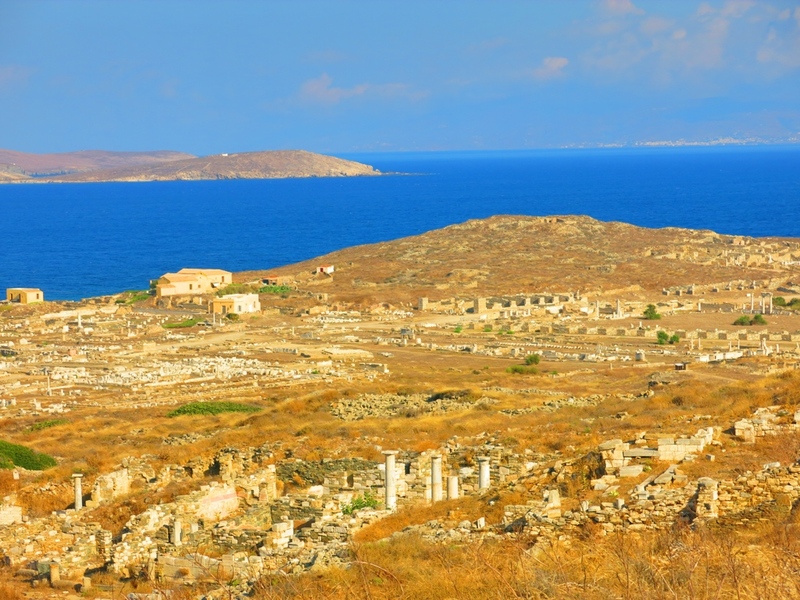 No visit to the Cyclades in Greece would be complete without a trip to Delos, the literal and figurative center of these islands. 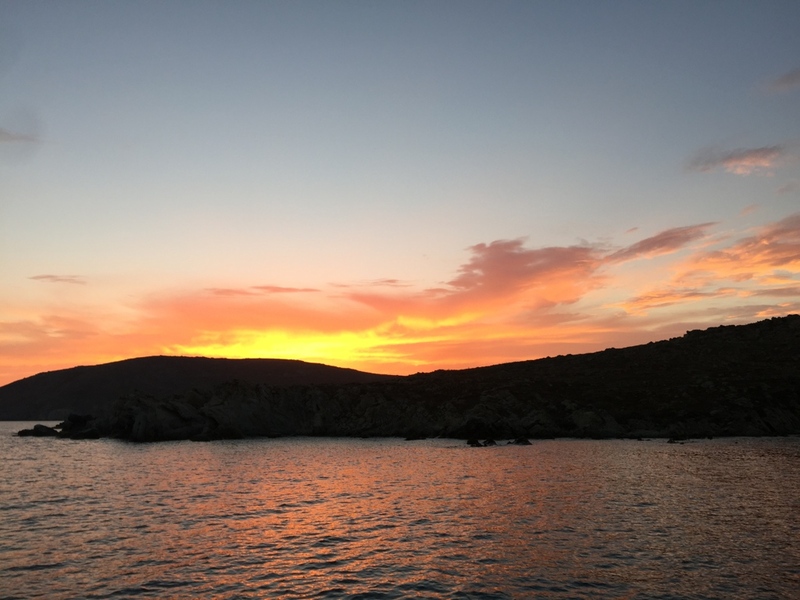 The name Cyclades comes from the Greek word kyklos, meaning circle, and the rest of the Cycladic islands encircle sacred Delos. According to Greek Mythology, Delos was where Leto gave birth to Apollo and Artemis, her twins fathered by Zeus. Even in a myth, it’s not surprising that Zeus’ wife, Hera, would not be happy that her husband had strayed. In this story, she banished Leto from the earth and issued an edict that no land on earth could allow Leto to give birth there. Poseidon took pity on her and provided Delos as a place for her to give birth in peace. 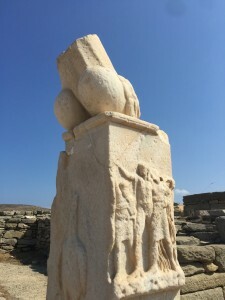 As the birthplace of Artemis and Apollo, Delos became a sacred site for the ancient Greeks who covered it with many temples and sanctuaries dedicated to the gods, which attracted pilgrims from all over Greece and turned Delos into a prosperous trading site. 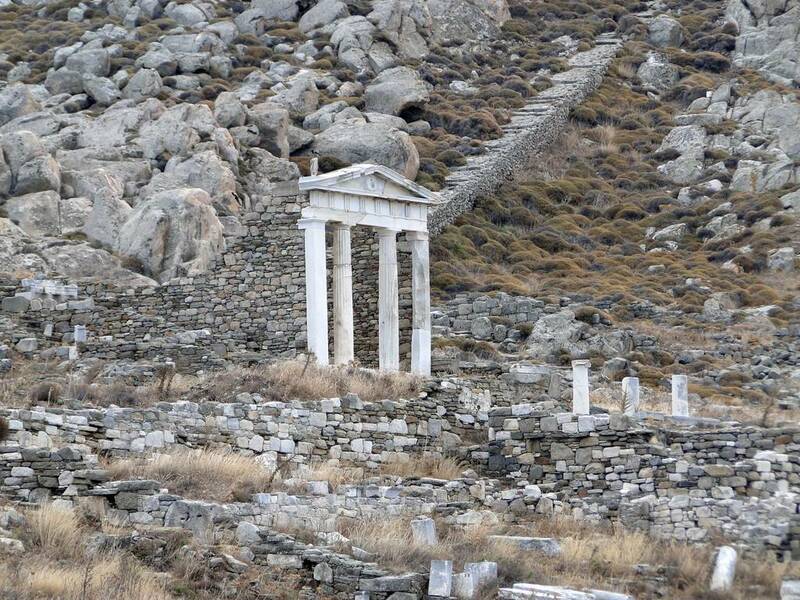 When you think of Greece as being the cradle of civilization, Delos fits the bill. The island was first settled in 2,600 BC, hit its stride in the 8th century BC, and reached a highpoint as a bustling commercial port between the 2nd and 1st centuries B.C. 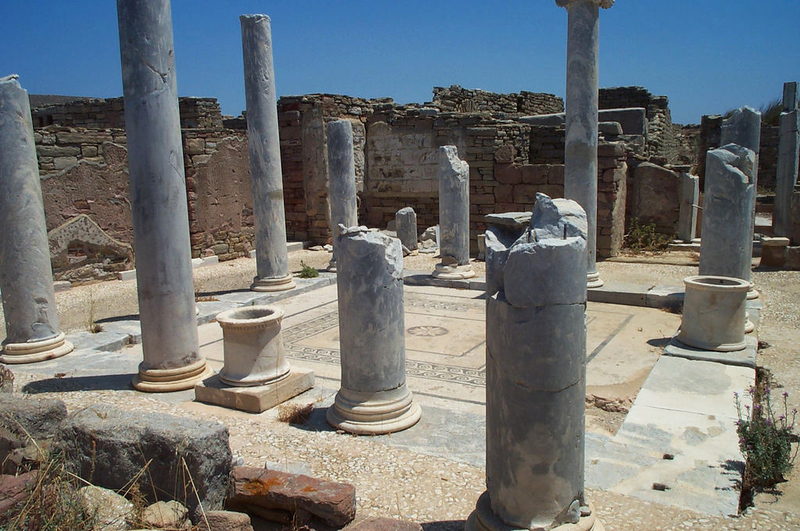 As a hub of trade and commerce, Delos was home to rich traders and ship-owners who built two-story mansions around courtyards with pebble floors and colonnades to offer shade from the sun. They opened shops selling food and fabrics, and created markets filled with goods from neighboring islands, and later, the whole Mediterranean. 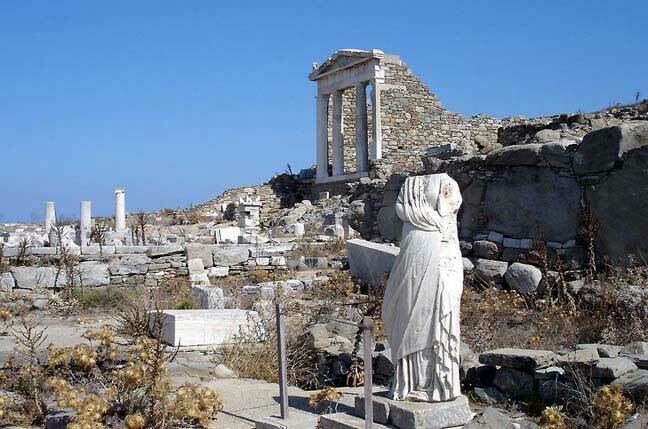 Among what was traded in Delos were as many as 10,000 slaves sold each day because Delos was the center of the Aegean slave trade. 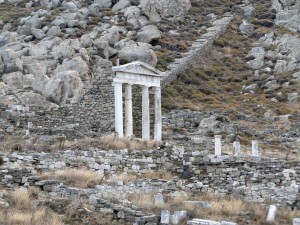 In the 1st century BC Delos’ economic prosperity ended. In 88 BC, the unfortified island was attacked as part of a revolt against Roman rule. The entire population of 20,000 was either killed or sold into slavery, sanctuary treasures were looted, and the city was razed to the ground. The Romans partially rebuilt the city, but continuous pirate raids kept Delos from getting its second wind, and the life of Delos slowly died out. Eventually, it was deserted, plundered and destroyed. the Venetians used it for a while as cheap quarry. The island was abandoned in the 6th century A.D and until French archeologists unearthed its ruins in 1872. We sailed to Delos from Syros in 25+ knot winds on our way to visit friends who live on Mykonos. The island is small, only 1 kilometer wide and 5 kilometers long, of barren, hilly landscape. We had read that you are not allowed to anchor at Delos overnight. Since we arrived in the late afternoon after the archeological site and museum were closed, we anchored offshore and swam in the bay searching for the underwater archeological site that had recently been discovered. Before dark, we sailed a short distance and anchored off the adjacent island of Rhinia. 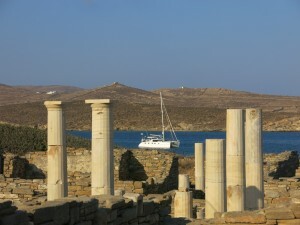 In the morning, we sailed to Delos and were the first visitors to arrive. 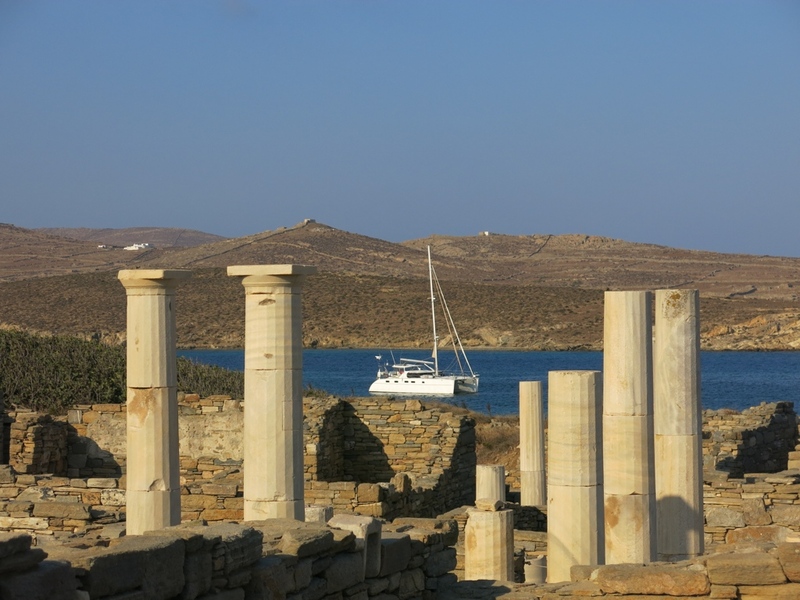 What a pleasure it was to have Delos all to ourselves for an hour before any of the daytrippers arrived on the ferries from Mykonos and other larger islands. The first thing was to walk through the narrow labyrinthine stone streets of the ancient town until we reached the base of Mount Kynthos. We climbed its rocky slope amid fragrant sage and thyme until we reached the summit, and Zeus’ sanctuary. There we said a special wedding blessing to our friends’ daughter, Janai, and her husband Rafa, whose wedding was taking place in Oregon as we reached the summit of Mount Kynthos. 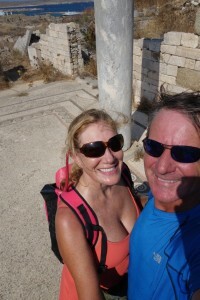 The summit is very windy but affords a spectacular view not only of the whole island if a Delos, but also of the sea and surrounding islands. As we descended Mount Kynthos, we could see the ferry arriving from Mykonos and disgorging its passengers. No one, not even the staff, lives on Delos, and everything must be imported to the island. There is a small cafe serving the most expensive snacks in Greece, but after paying only 5 euros a person to enter Delos, including entry into the museum, which we considered a very low fee for this site, we were happy to subsidize a Delos by patronizing the cafe. Having started our solitary tour early, we were also able to conclude early. The whole island shuts down at 3 pm every day anyway, and visitors who arrive by ferry have only four hours to see it all. Are Gray Whales the Ocean’s Friendliest Creatures?